By boldly disrupting proportions, accentuating volumes and playing up the contrasts between colours and materials, the Libre watch collection stretches the imagination of what a feminine watch can be. A ring of open petals set with diamonds and black spinels form a glittering bloom around the white gold case. It’s like wearing a corsage, only with far more adult sophistication thanks to the precious stones and metal. Limited to 50 pieces. Luxuriate in the spellbinding mosaic of baguette diamonds, white mother-of-pearl, Tahitian mother-of-pearl and black spinels. Oh, and it tells time too - at the heart of this mosaic is a tiny, tiny black dial with hour and minute hands. Only 20 pieces are made. Fancy a cascade of sparkling diamonds on your wrist? Limited to 15 pieces, black spinels lend depth to the avalanche of ice that forms the sumptuous bracelet. The theme continues around the narrow oval dial, which is framed by a top row of diamonds and a bottom row of black spinels. The wire strips wrapping around the watch, which is limited to 50 pieces, are actually oversized Roman numerals coated in glossy black ADLC. The bezel of the oval-shaped white gold case is paved with diamonds, some of which are hidden under the black strips. No, it’s not damaged and that’s the beauty of Cartier’s Crash watch, whose macabrely bent edges look like it has suffered a high-impact, well, crash. 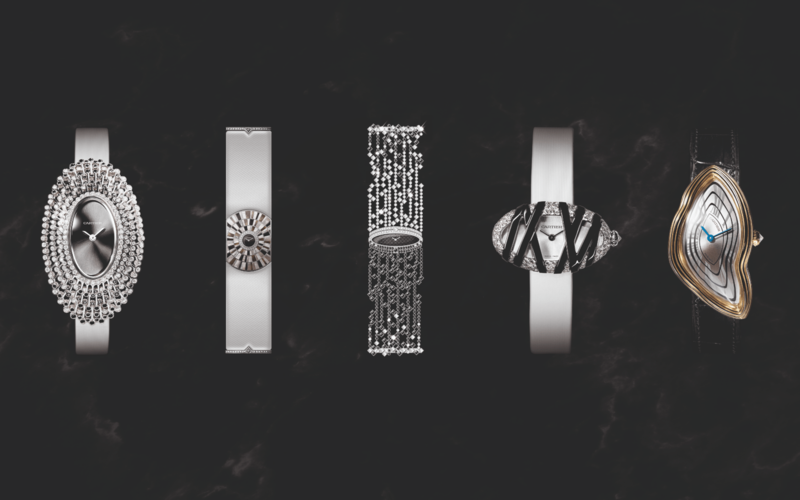 This time around, the designers at Cartier Watch Creation Studio in Paris have taken the design to even more extreme ends with shockwave patterns carved into the dial. With a case crafted in yellow gold and a manual-winding 8970 MC movement, each of 50 pieces available is numbered for exclusivity.